HealthStream Announces the Promotion of Chief Operating Officer J. Edward Pearson to President | HealthStream, Inc.
NASHVILLE, Tenn.--(BUSINESS WIRE)--May 16, 2018-- HealthStream (NASDAQ: HSTM) today announced Chief Operating Officer (COO) J. Edward (“Eddie”) Pearson has been promoted to President, effective immediately. Mr. Pearson will remain as COO as he concurrently assumes the new role of President. Chief Executive Officer (CEO) and Chairman of the Board of Directors Robert A. Frist, Jr., who previously also held the title of President, will remain as the Company’s CEO and Chairman. Mr. Pearson, 55, is a 12-year veteran of HealthStream and has served as its COO and Senior Vice President since 2011. He is responsible for day-to-day operations throughout HealthStream—with executive oversight of the Company’s product development & management, sales & marketing, customer operations, and IT infrastructure & security. Since Mr. Pearson’s addition to HealthStream and its Executive Team in 2006, the Company’s customer base of healthcare organization subscribers has more than tripled, solidifying HealthStream’s position as the leading provider of workforce development solutions for the healthcare industry. In his tenure at HealthStream, Mr. Pearson has played a pivotal role in executing HealthStream’s growth strategies. He has been, for example, instrumental in the development and implementation of the Company’s “solution groups” operating model, which drives customer-focused product development, sales, service, and innovation. He has helped define and successfully launch business management processes that are currently utilized across the Company, including the creation of core data and analytics tools used by sales and product leaders to manage each solution group. 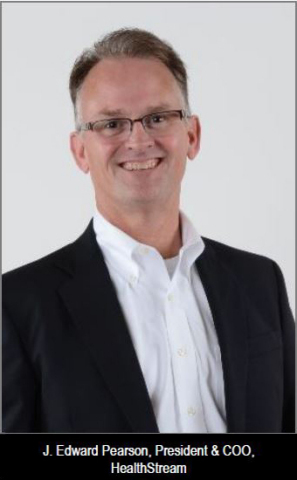 Prior to joining HealthStream in June of 2006, Mr. Pearson served as President and CEO of DigiScript, Inc., Chief Financial Officer (CFO) and Executive Vice President of Inforum, Inc., CFO of HIE, Inc., CEO of empactHealth.com, and CEO of Medibuy. His leadership in the healthcare industry has also been recognized through his participation as a Nashville Healthcare Council Fellow in the class of 2014. Starting his career with a Bachelor’s Degree of Business Administration from Middle Tennessee State University, Mr. Pearson first worked at William Puryear & Company, a public accounting firm, as a CPA. Alongside his leadership at HealthStream, Mr. Pearson has long exercised a strong commitment to community service. He is currently a Board member for both the Nashville Memorial Foundation and Best Buddies International (Tennessee Chapter). He was a founding Board member and past Chairman of the Board of John Paul II High School. HealthStream (NASDAQ: HSTM) is dedicated to improving patient outcomes through the development of healthcare organizations' greatest asset: their people. Our unified suite of solutions is contracted by, collectively, approximately 4.8 million healthcare employees in the U.S. for workforce development, training & learning management, talent management, credentialing, privileging, provider enrollment, performance assessment, and managing simulation-based education programs. Based in Nashville, Tennessee, HealthStream has additional offices in Brentwood, Tennessee; Jericho, New York; Boulder; Colorado; San Diego, California; and Chicago, Illinois. For more information, visit http://www.healthstream.com or call 800-933-9293. This press release contains forward-looking statements that involve risks and uncertainties regarding HealthStream. Investors are cautioned that such results or events predicted in these statements may differ materially from actual future events or results. This information has been included in reliance on the “safe harbor” provisions of the Private Securities Litigation Reform Act of 1995. Investors are cautioned that such results or events predicted in these statements may differ materially from actual future events or results.These forward-looking statements are based on a variety of assumptions that may not be realized, and which are subject to significant risks and uncertainties, including that the acquisition may not be consummated and that the anticipated financial and strategic benefits of the acquisition may not be realized, as well as risks and uncertainties referenced from time to time in the Company’s filings with the Securities and Exchange Commission.